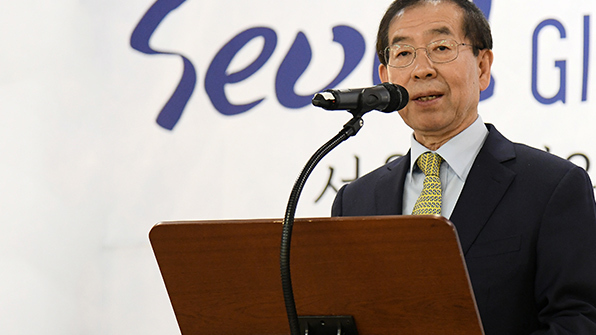 The municipal governments of Seoul and Los Angeles have agreed to pursue joint marketing activities for the two cities’ tourism resources. Seoul Mayor Park Won-soon signed the agreement with visiting Los Angeles Mayor Eric Garcetti at Seoul City Hall on Thursday. Under the deal, the two cities will join hands in advertising their tourism projects via online events and ads. The two mayors also agreed to strengthen people-to-people exchanges and cooperation on global warming and gender equality. Park said Seoul and LA share universal values such as human rights, environment and gender equality, and have become partners through the deal to ensure and fulfill those values together. He also requested cooperation from Garcetti on sustainable management of the Koreatown in Los Angeles. Garcetti promoted his city as both a tourism and investment center, saying it welcomes more South Korean tourists and business people.